Sophisticated elegance, the Clé de Cartier ladies' watch presents a 35mm stainless steel round case, holding a silver sunray effect dial behind sapphire crystal. Three black hands grace the dial with self-winding movement, black roman numeral hour markers, and a date display window at the 6-o-clock position. A textured red leather strap finishes this timeless timepiece. 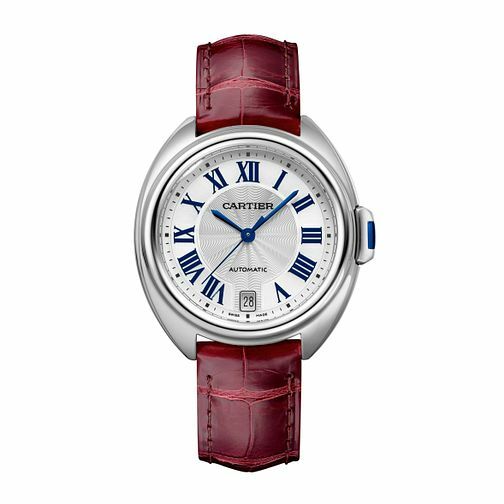 A pioneer in watchmaking, Cartier seamlessly blends cutting-edge technology with passion and elegance in design.